Paperback: The Game ($3.99) by Fowers Games Inc. is the mobile port of the physical deck-building card game. 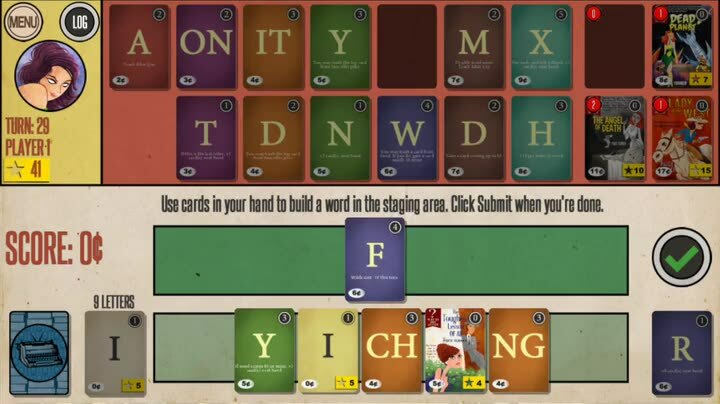 If you’ve played the physical game and love the rising trend of boardgames going digital, such as Exploding Kittens and Sushi Go!, then you will enjoy Paperback: The Game, especially if you love word games like Scrabble. As a writer, naturally I love words and expanding my vocabulary, so word games are a genre that I thoroughly enjoy. 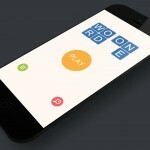 I’ve gone through dozens of Scrabble-like clones in my time with an iPhone, and I also spent a lot of time with more unique word games like Letterpress. However, in the end, these games got a bit tiring because it was the same thing for the most part, just in a different skin. It’s been a while since I’ve discovered a great word game to play and pass the time, but I think that has changed with Paperback: The Game. Honestly, I have never heard of the game until recently, when I saw it on the App Store, and as a writer, I found it quirky and relatable. 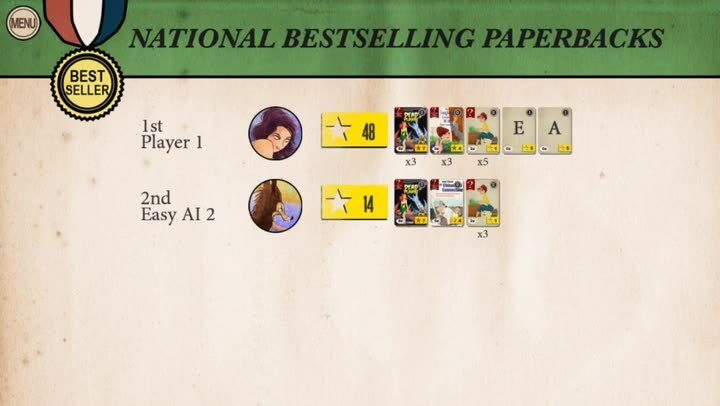 Visually speaking, Paperback has a distinctive kitschy look and feel to it that truly makes it stand out among the overcrowded word game market. 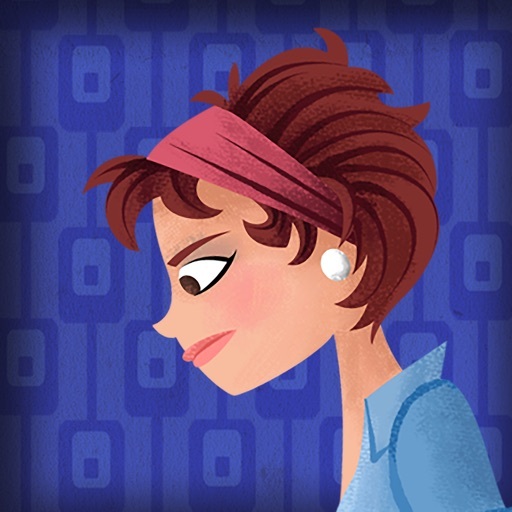 Players are greeted with stylish, pulp novel artwork that feels like a blast from the past. There are fine details and textures everywhere, from the character designs to the letter booklets themselves. If you take a look at the novel cards, even though they’re small, they feature fantastic artwork so that it looks like a novel that you could pick up at the bookstore many years ago. Colors in the game range from soft and light tones to dark and richer hues, and everything just comes together nicely. Animations are smooth and fluid, and the upbeat, eccentric soundtrack is a joy to listen to. And as a writer, I was delighted to hear the page-turning and typewriter sound effects as you play, because it just makes me feel right at home. There’s only one game mode in Paperback, but a game can consist of two to four players. You can go head-on with actual players in a local game (pass the device around) or choose from Easy, Smart, or Smarter AI. You can also change the number of novel cards that are allowed in the game if you want to, but a “Reset” button makes it easy to go back to the defaults at any time before the game. So how do you play? Even if you’re a newbie like me, the game does have a tutorial in the first game to show you the basics, though I am pretty sure it could be explained better in-game. 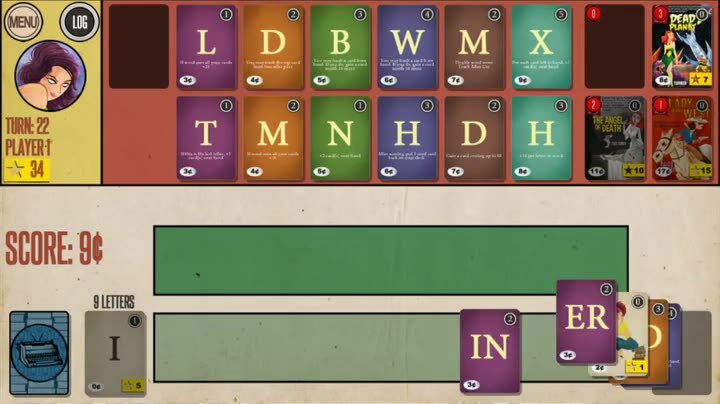 Regardless, each player will have their own deck of letter cards, which are like tiles in Scrabble. You’ll draw enough cards and you’ll want to spell out a word with what you have in your hand, even drawing another letter from the pile next to the hand if needed (one per turn). The letter booklets can consist of single or double letter combinations, and there are the novel covers that serve as wildcards when you need some help. When your word is scored, you’ll earn a few coins (each letter has its own worth) that you can use to purchase more cards from the top half of the screen, and these get added to your deck to use. Some cards will have abilities, and you can long press on the card to view abilities, cost, and how many stars it is worth. The better cards cost more to get, so you’ll have to know your vocabulary in order to do well. 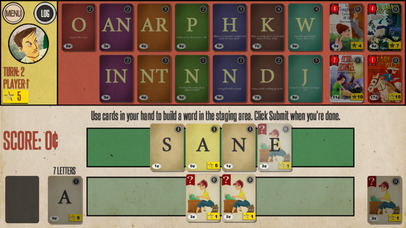 The game ends once two of the novel piles on the right side are empty, and the player who has the most points by then wins the game. While the game has a tutorial, it isn’t exactly clear from the get-go how words are scored. This is a bit annoying, because you’ll have to play a few rounds before you fully understand the game. 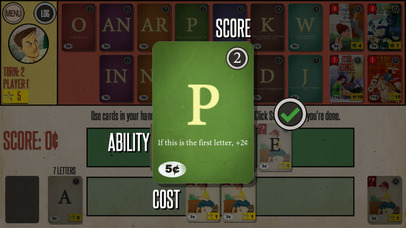 But each letter has a point value that is shown in the top right corner — if you can get a point for the letter, you’ll earn a penny for each point that the card is worth, allowing you to buy better cards for your deck. 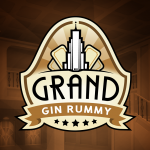 There is definitely a learning curve to the game, since it’s not as straightforward as other word games, but it’s still enjoyable for fans of the genre. I’ve only played a few rounds of Paperback so far, but I’m liking it so far, despite not playing the original physical form of it. If you did play the physical game, you may notice some things are different, such as the lack of attack cards as noted by one iTunes reviewer. Still, for anyone who is new to Paperback or not, there is a lot to like with this mobile port. The graphics are stunning, the music is charming and delightful, and controls are simple enough for anyone. I just wish that the tutorial covered more about scoring and such, because it is not clear to players right away, especially those who are unfamiliar with the rules. Hopefully this gets fixed in a future update. 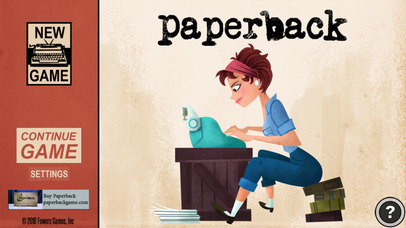 I recommend checking out Paperback: The Game if you’re a fan of boardgames, words, and novels. You can get Paperback: The Game on the App Store as a universal download for the iPhone and iPad for just $3.99. There are no in-app purchases.